Craig Oag (u 8 winner) and Nicola Oag (under 12 winner). After much planning and fund raising the combined efforts of local Thrumster groups and individuals has culminated in the opening of Thrumster Station garden. Arras MacKay and Jim Rosie cutting the ribbon. Arras worked there as a young man, and continued on the railway in Wick after the little Wick/Lybster line closed, as did Jim's father. Jim and his brother and sister were born in the station-master's house next door. A recently published HMI report on two-teacher Thrumster Primary School in Caithness, has praised the very good standards of attainment in English language and mathematics, together with teachers' high expectations of pupils' overall achievements. The staff and pupils at Thrumster School were delighted to receive the gift of a bench for the playground from Rebecca Mackay and Craig Oag who will be moving on to Wick High School on return to school in August. The Thrumster PTA held walk to raise funds for the school. the walk was to have been followed by an outdoor barbecue but due to weather it was moved inside. The walkers headed towards Thrumster House and back to the Village Hall. High Quality Photo for Printing - Will take longer to download but should provide a good print of the group of children. Members of Yarrows Heritage Trust were in Thrumster Primary School to present prizes to the pupils who had entered their competition. Pupils were asked to create a picture of the area around the Old Station at Thrumster as they would like to see it. The children's pictures have been used to support the Trust's grant application for improving the Old Station at Thrumster. Prizes were presented to winners in the P1-3 , P4-5 and P6-7 categories by Jamie Stone , MSP. P1-3 First - Stewart Atkins Second - Ben Miller 4-5 First- Gary Bremner Second - Grant Anderson P6-7 First - Rebecca Mackay Second- Emma Taylor. Highly commended prizes went to Craig Gill, Andrew Mackay, Tom Taylor, Caitlin Harvey and Lynn Sinclair. Thrumster Primary School and Nursery have gathered toiletries and other items which will be passed to Blythswood who will arrange for these items to be forwarded to the victims of the Tsunami disaster. Pupils also collected some money to help with the transport costs. Pupils would like to thank everyone for their support. 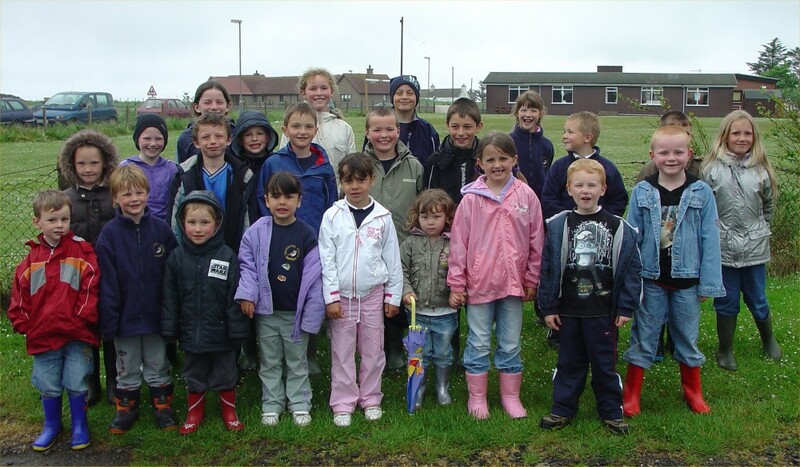 Thrumster Primary School has won Scottish Natural Heritage's 2003 competition celebrating Scottish Schools Grounds Week. The first prize is an expenses paid excursion for all from the two teacher Caithness Primary School to a wildlife site in the north with bus hire, picnic lunch, activities and expert guides. Schools were asked to describe what their school's grounds were like at the moment and what could be done to improve them for nature, environmental education and their enjoyment. The competition was open to all schools in SNH's North Highland Area, i.e. Caithness, Sutherland and North Wester Ross. Natural heritage books and wildlife posters will also go to the three runners up: Golspie Primary School (Primary 4), Mount Pleasant Primary School, Thurso, (Primary 4) and Mount Pleasant Primary School, Thurso, (Primary 5). Poster sets also go to highly commended entries from Bonar Bridge Primary School and Castletown Primary School. All the schools above will now be encouraged to develop their ideas further and apply for a SNH Schools Grounds Grant which could offer up to 100% funding for natural heritage projects. Morven Murray, retired High School biology teacher and one of the competition judges, said "The unique feature of Thrumster School's entry was the great sense of humour in all the individual components and the fact that the pupils had looked at their school's grounds through the eyes of the wildlife which might visit it." Ian Mitchell, Development Officer for SNH in North Highland, added that "it was a unanimous decision that Thrumster should win given they not only described in words what they felt they wanted for their grounds but they backed this up with amusing illustrations, poems, paintings and some wonderful colourful models". Head Teacher at Thrumster Primary School, Mrs Linsey Mackay, was delighted to receive the news of their success and explained: "All our pupils were involved in completing the project, doing modelling, writing and painting. Everyone here is, of course, really pleased that our entry was chosen by the judges and are all looking forward to our prize outing later this autumn." The attached photos were taken today (30/9/03) at Thrumster Primary School when the prize winners certificate was handed over by SNH's Ian Mitchell to Hollie Gibson and Henry Taylor, Primary 1 pupils. Also in the photograph is Marina Finlayson, Highland Council Ranger for East Caithness. Given the success of this year's competition, SNH has announced it will run another "Natural Playgrounds" competition to be judged at the same time next year. This time the task will be to get individual pupils or classes/schools collectively to design a bird table and/or a wildlife feeding area for their playground. The prize will be to work with the schools to have their design turned into reality and made out of natural materials. Details of this new competition will be sent to all schools in North Highland in the next few weeks.